A must read for all pet lovers! This new ebook from B. 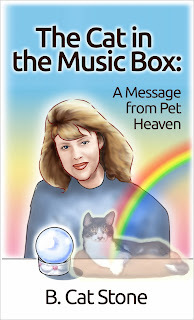 Cat Stone offers real proof our pets enjoy a wonderful afterlife after they die, and we can communicate with them! Have you ever wondered what happens to your beloved animal’s spirit when they pass away? Do you believe there’s a pet door to heaven…that you’ll be reunited with them in the afterlife? Have you felt the heartache of losing a pet and needed help getting through your grief? Read The Cat in the Music Box: A Message from Pet Heaven, an incredible true story from award-winning author B. Cat Stone, and discover paws-itive proof that after passing, your furry, feathered or other pet enjoys happiness in a beautiful, heavenly place, and your friendship continues! B. Cat Stone (Barbara) is an award-winning author and a member of the Cat Writers’ Association. Animals have been the center of her life for many years. She is the founder of Animal Rescue & Care Home (ARCH), a no-kill, nonprofit shelter. Her indie publishing company is Cat Box Press: www.catboxpress.com. Looks like a good book. Dang, I have a Nook instead of a Kindle. Reading on the computer is out too. Oh well, maybe next time. Thank you. Sounds really good.